She did agree with Dr. Shoecraft that teaching aids that provide students with hands-on experiences were better for her young students than pencil and paper. She also agreed that even young students should understand numerical equality, i.e., 3+4 and 1+6 and 7+9 all equal 7, as an introduction to learning equations in their higher grades. Mrs. Anderson first tried the balance beam teaching aid with her students while being observed by Port O’Connor principal Marilyn Bratcher. Students hang markers on each end of a balance beam to work simple addition problems. When the beam balances, they know they have the correct answer. By the end of the lesson, the students had determined on their own that if a=b and b=c, then a=c. Excited by her students’ initial success, Mrs. Anderson then introduced “Bank It and Clear It,” a game that employs wooden [plastic Fair Lands] blocks to teach number bases. For this game, students may pretend that they are in “Two Land,” “Five Land,” “Ten Land” or “Twelve Land” as they learn base 2, 5, 10 or 12 numbering systems. Another “Bank It and Clear It” technique soon has the young students adding columns of three and four-digit numbers faster than most adults. “Touch Math,” a … program that assigns touch points to each number allows children to add and subtract even if they know their numbers only by rote, she said. PORT O’CONNOR — It began as a simple challenge, but that challenge has come full circle for a Port O’Connor teacher who is teaching kindergarten students second- and third-grade level math. Students in her class — some not yet five years of age — eagerly count whole and fractional units, work algebraic equations to compute area, multiply and divide, graph coordinates and beg for “monster problems” to challenge them more. To these students, math is exciting as they play “Touch Math,” “Bank It and Clear It,” “Fraction Cakes,” and “Tug of War,” games played with balance beams, linear gameboards, pegboards and other “hands-on” teaching aids introducing them to basic math concepts. This by Judy Anderson, a teacher who readily admits that in the fourth grade she made a “D” in math and was convinced that she just wasn’t smart enough to understand math. “In our society, if you can do math, you are perceived by yourself and by others as a ‘smart’ person because math is a high prestige subject,” Mrs. Anderson said. 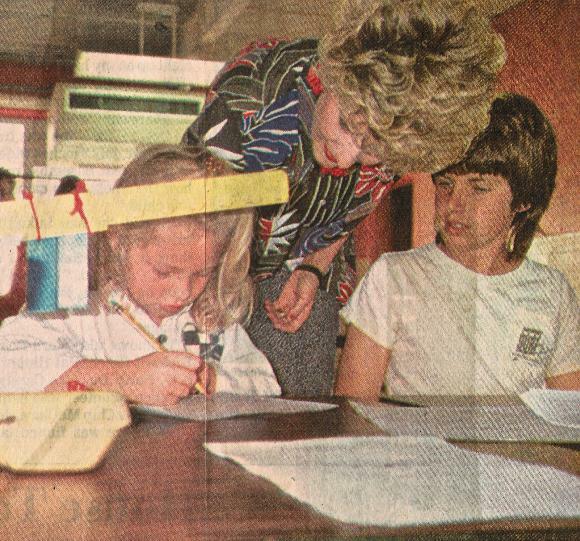 Like many elementary school teachers, she once was more comfortable with her language art skills and relied heavily on worksheet and rote memory assignments to teach math. To increase her math competency, she attended a graduate-level University of Houston–Victoria course taught by Dr. Paul Shoecraft in Port Lavaca last August. Judy Anderson, Port O'Connor kindergarten teacher, works with Jessica Young and Justin Tigrett on solving a problem using the “Math Modality” teaching techniques she learned in Dr. Shoecraft’s class.